"I am a friend of deceased co- worker (Chris Wilson) with..."
Ruth passed away in Vancouver, WA. She was born in Newton Falls, OH to Forrest and Helen Welches. She graduated from high school in Merrillville, IN. 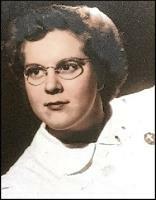 The Cadet Nurse Corps enabled Ruth to complete her courses as a registered nurse from Methodist Hospital in Gary, IN. She completed CRNA training at Ball State in Muncie, IN, and retired from Kaiser Permanente in Portland, OR in 1990. Ruth enjoyed her pet dogs, oil painting, cabin on the Washougal River and travels to Europe. Ruth is survived by her sisters, Betty and Martha; niece and nephews. She left many fond memories and will be dearly missed. Her ashes will be scattered in the places she loved the most.